Bhadrakali Temple | Highway - the only way ! Day 2 of our trip began on a delicious note with the buffet breakfast at Haritha Kakatiya, Hanamkonda. Breakfast at Haritha hotels is simple but always enjoyable. We were also relieved (this paranoid writer definitely was !) to be in a place we were familiar after traveling on little known, deserted, scary roads the previous day, ! 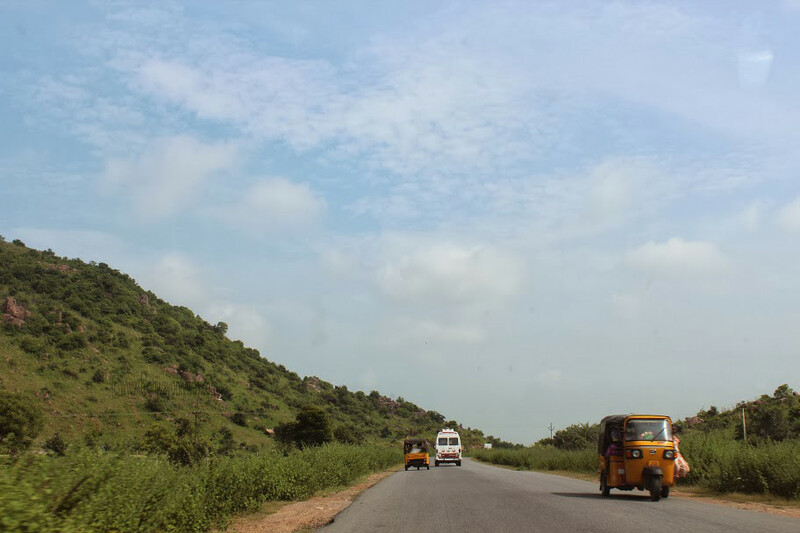 Having covered most places on the tourist circuit of the tri cities – Kazipet,Warangal, Hanamkonda, we set out to visit 3 places that we missed on our earlier trips. 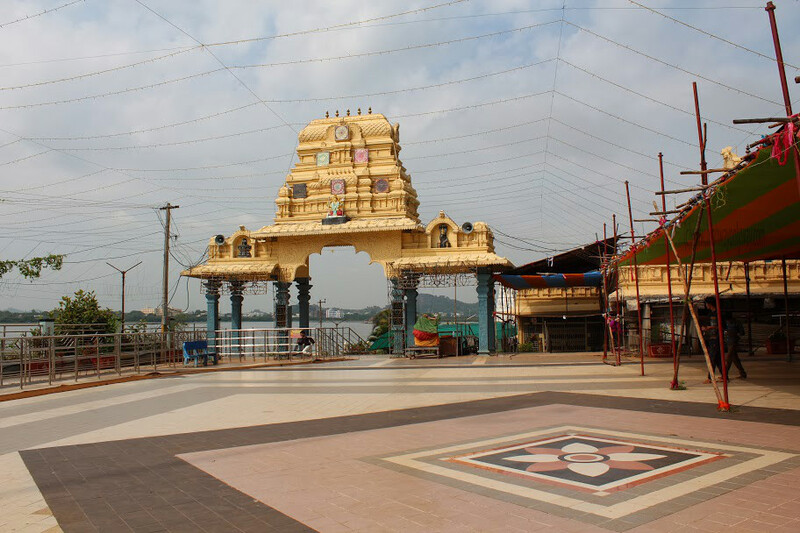 The first on the list was Warangal’s Presiding Deity – Bhadrakali Temple. Enroute the Bhadrakali Temple, we passed by the famous 1000 Pillar Temple in Hanamkonda, now huddled between modern buildings and traffic, it is sad to see the state of the monument. The 1000 pillar mandapa after which the temple has been named has already been dismantled for renovation, how long will the main temple survive in the middle of modern day din? We do hope the authorities are doing something about it. We’d already visited this temple earlier and so we drove to the Bhadrakali temple. The Kakatiya empire was technically established by King Prola II, a feudal king of the Western Chalukyas around 1110 A.D. Though the foundations of the kingdom were laid atleast a 100 years before, they continued to be vassal kings of the Chalukyas until Prola II declared his kingdom independent of the already declining Western Chalukya rule and thus began the Kakatiya saga. About 400 years before the Kakatiya kingdom came into being and Warangal became their capital, the Chalukyas had set foot in Warangal. The popular belief is that Pulakesi II, after his victory over the Vengi kingdom, built the Bhadrakali temple in 625 A.D. This is based on the inscriptions found in the temple. Was it a sign of things to come? For, 4 centuries later, the Kakatiyas who actually took over from the Chalukyas and despite being devotees of Lord Shiva and building grand temples in his honour, worshipped Goddess Bhadrakali as their Presiding Deity. An interesting historical link that we found when we visited the Bhadrakali Temple. After a lot of confusion thanks to the diversions and one-ways (Hanamkonda is fast becoming like its big brother, Hyderabad ! ), we finally reached the Bhadrakali temple. We had visited this temple 7 years ago but didn’t seem to remember much of it, perils of hitting the 30s we think ! 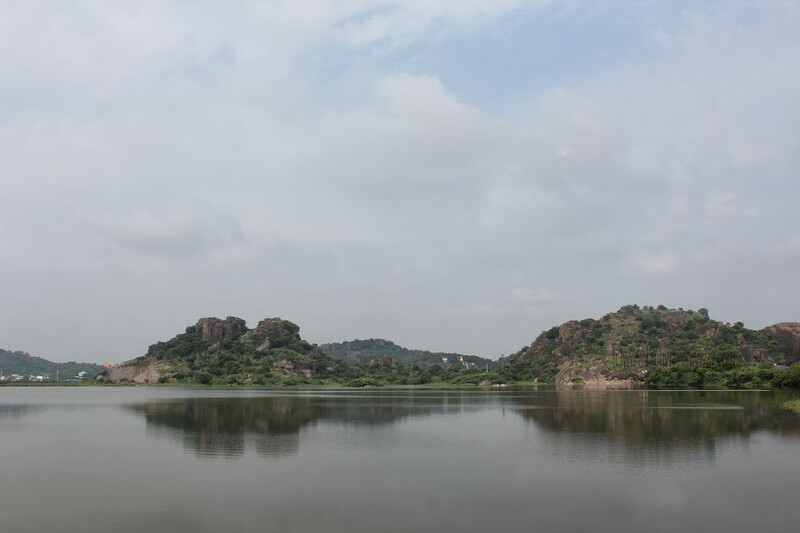 The first thing that gets your attention is the Bhadrakali Lake, built during the Kakatiya reign. Most lakes in and around Warangal are man made lakes, almost all of them were dug up by the Kakatiyas as a means of irrigation and water supply. These lakes are huge stretching to 2 kms in distance. Such great visionaries they were, even to this day, these lakes continue to serve the purpose ! The Bhadrakali lake is very picturesque surrounded by hills and one should say it adds beauty to the temple. As you proceeded to the temple, an information board tells you about the history of the temple, Pulakesi II and the story of a Brahmin devotee of the 1950s who dedicated himself to reviving and renovating the temple when he found the temple ruined and forgotten for centuries after the Kakatiya rule ended. If the Bhadrakali temple exists today, a lot of credit goes to him. Today, the Bhadrakali temple hardly has anything reminding you of its ancient past. Totally renovated and looking brand new, the temple was getting ready for the Navratri celebrations when we visited it. Temple premises is spacious and pleasant, it was not very crowded while we were there. Come Navaratri, you can expect the usual hustle bustle of popular temples. There is very little trace of the temple’s antiquity expect near the Garbha Griha where the ancient pillars and the structure is still visible. Around this small structure, halls and platforms have been built. We cannot bring you picture of the temple because photography is not allowed inside. Inside Goddess Bhadrakali is seated with a smiling, peaceful face. The temple information board also says that originally the Goddess’ idol was fierce looking, during the renovation of the 1950s, the face was changed to give the idol a pleasant look. We wish there was a painting or a picture of the original idol, the ancient image is now lost ! We spent about half an hour in the quiet surroundings enjoying the lake breeze. 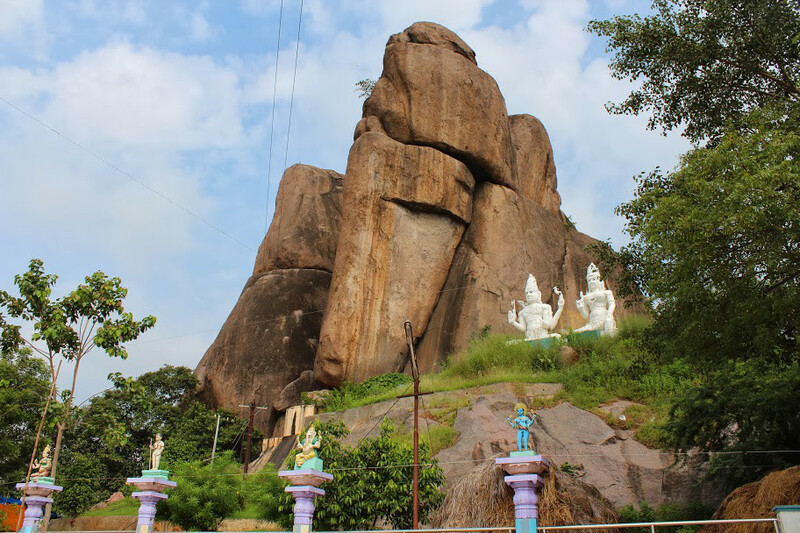 The area around the temple and the boulders near it have been beautified with recent additions. For a thousand years and more, Goddess Bhadrakali has been the Protectress of Warangal. Taking leave of the temple, we took this scenic road t0 the next place on our itinerary. Our next destination was Ghanpur. 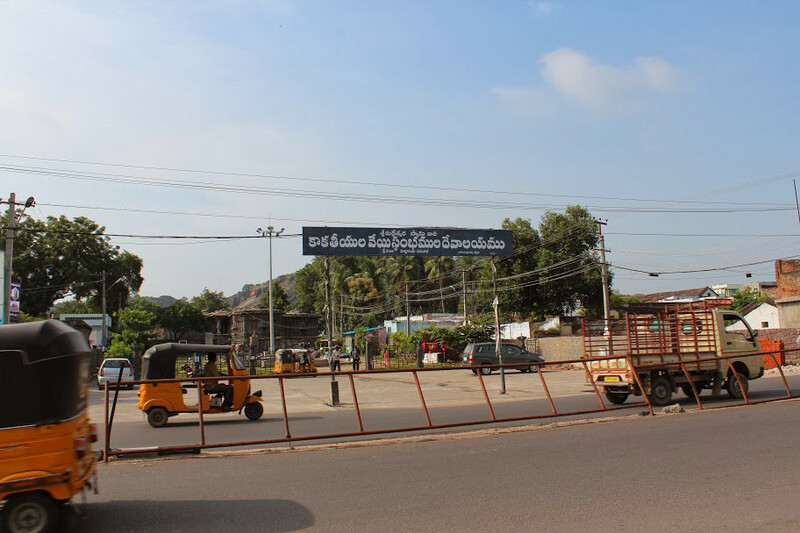 – Bhadrakali Temple is within Warangal city, transportation is not a problem at all. – The temple is open between 5 AM and 1 PM and 4 PM to 9 PM. – We read on the internet that there is a musical garden and a park for children near the Bhadrakali Lake, it seems boating on the lake is available from there. Since we did not know about it, we missed this, we do not have an idea about the timings.